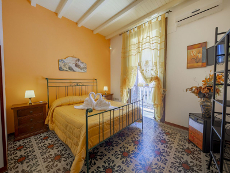 The B&B is divided in 4 rooms completely equipped with conditioned air, tv to satellitare and approached Internet. Every room has a private bath with shower and can accommodate from 1 to 4 persons. The typical italian breakfast is served at a nearby cafe' in the square. WE DON' T HAVE A PRIVATE PARKING AND ELEVATOR.